Friday Flashback: Murmur by R.E.M. 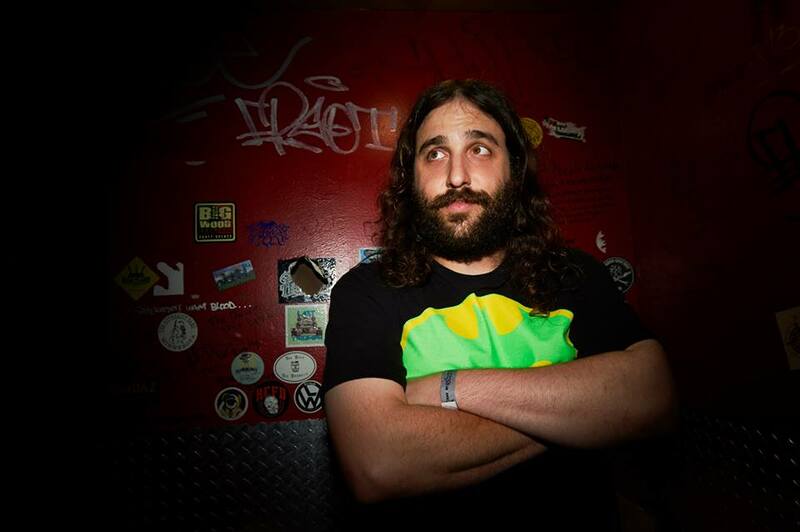 Lawrence, Massachusetts, native Danny Bedrosian decided at a young age—i.e., 10 or 11—that he wanted to be the keyboard player for funkmeister George Clinton’s band Parliament-Funkadelic, aka P-Funk. After that, there was never a plan B.
Bedrosian was classically trained as a child by his mother and father, each of whom were honors music graduates of Lowell State College (now UMass Lowell). As a teenager, he would travel throughout New England to see P-Funk perform, meeting Clinton and giving him recordings of his playing at every opportunity. He got his first paid assignment for the band at age 19, officially joined at age 22, and is now in his 13th year of service. Coming from a family of Armenian extraction, Bedrosian studied Middle Eastern history at the University of New Hampshire and is something of an expert in Armenian history and ethnomusicology. 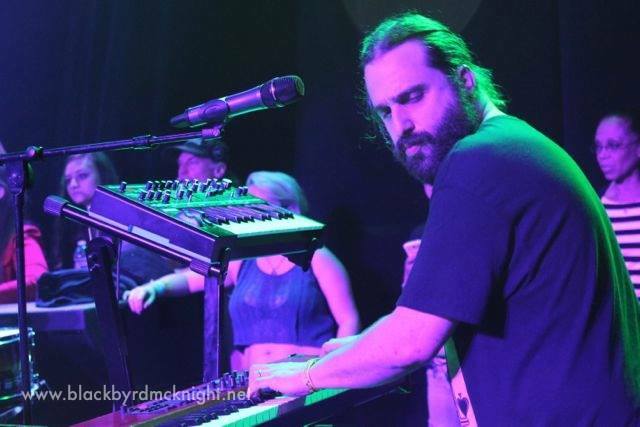 In addition to his work with P-Funk and several other projects, he fronts the band Secret Army, which released a new album called The Clock this year. He is also the father of a four-month old daughter. Q: How did you first meet George Clinton and was it in any way the first step toward your joining P-Funk? A: There was a contest in ’97, ’98, back when George was wearing those big bedsheets. He’d cut a hole in a bedsheet and wear it over his head. That was like his costume. He was doing a contest where fans could make the bedsheet and the best ones would win a chance to meet him. I put together a bedsheet, made with all the different lyrics and stuff, pictures of different characters from the mythology of P-Funk. [It was] very carefully planned and executed, and he loved it and he wore it at the show in Providence, Rhode Island. And I got to meet him and the band, and that was when I first started dropping off my music. I thought that if I could just meet him, I was sure there was a chance I could let him hear something, and if he heard it, I knew he’d like it. That’s how I went about it. Q: Are you the youngest member of the line-up? A: I’m the second-youngest musician in the band. The youngest is our first-line drummer Benzel [Benjamin “Benzel Baltimore” Cowan, Jr.], who’s also the drummer for my band Secret Army. He’s also the son of the longtime trumpet player for the band, who’s been playing for 37 years, Bennie Cowan. Other than him, I’m the youngest musician in the band, but I’ve been there for a longer time than a lot of guys that are even older than me. Q: Does having studied the Middle East at the University of New Hampshire come in handy nowadays? A: It comes in handy for my touring life in that P-Funk plays all six livable continents all year round. I meet people from the Middle East all over the world. It doesn’t matter if they’re Arab or Iranian or Armenian, if they’re Sunni or Christian or anything, there’s always a connection there. And that connection always helps me with reaching out to people, potential fans, also friends and just connections in general in this world of social networking. Q: Did you take any music classes in college? A: Yeah. At UNH, we studied directly under Clark Terry, the great jazz trumpet player. He was a very important honorary professor there. I took a number of American music classes on jazz and things like that. When I had first gone to college, I realized that a music major for me was not the move because I’d already done 18 years of fairly strict classical training under the tutelage of my parents in a very prestigious piano and music school. I knew that the music major for me was going to be review. Q: How may shows would you say that you play in a typical year? A: In a typical year, it’s anywhere between 240 and 320. It could be anywhere between 120 and 180 shows just with George. I play with about six to 10 different bands a year, give or take, but P-Funk is my main gig. I like to play. I like to work. I’ve got two of my own bands, plus my piano shows, plus I play in a ska band, I play in a jazz group, I play in an Armenian ensemble. Q: What is your most recent musical project and what can people expect at your Opus show? A: I just put out a new album calledThe Clock this year. It just came out in September. Secret Army is going to do stuff from basically every album that we’ve put out. We’re working on our eighth album now and next year will be our tenth anniversary as a band. We definitely going to do a lot of stuff from all the different albums and were going to do a little Funkadelic stuff, too, and maybe even surprise ourselves and do some brand brand new stuff. Q: How would the young you react to being told that he would one day be a permanent full-time member of P-Funk? 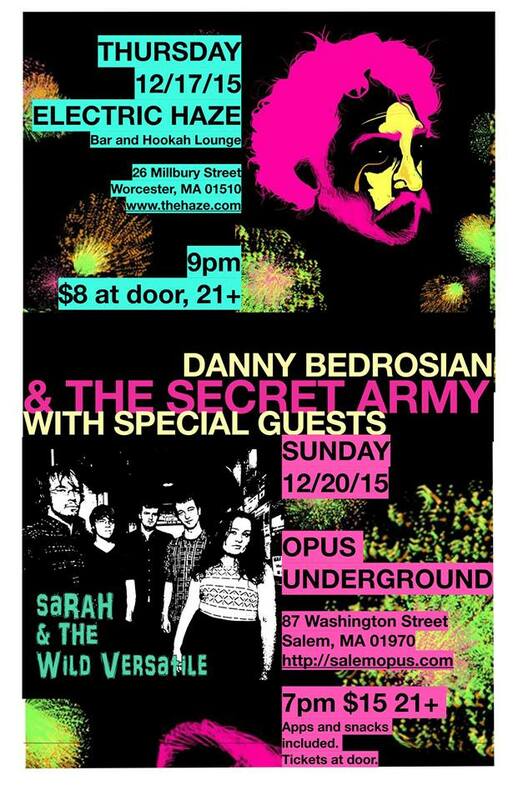 Danny Bedrosian & Secret Army with Sarah & The Wild Versitile at Opus Underground (97 Washington St., Salem, MA). Sunday, December 20, 7 p.m./$15/21+.